The Thirty Year Itch: Harry Bosch Comes to TV on Amazon! Harry Bosch Comes to TV on Amazon! I don’t normally write reviews of television programs. Hell, I haven’t watched a television regularly since my kids were born almost six years ago. But when I heard Amazon Studios was producing a television show featuring MichaelConnelly’s Los Angeles Police Detective Hieronymus Bosch, I knew I had to watch. And I was in luck, because the show is watched by logging into Amazon, so I didn’t have to worry about getting the remote away from my family! Harry Bosch has been a favorite of mine since I began reading crime fiction. Mr. Connelly, unlike many in the genre, has done an amazing job keeping the character interesting over time and eighteen books; Bosch changes as he ages, but the changes are subtle, consistent with the character. When I pick up a new novel featuring Harry Bosch, it’s like meeting up with an old friend. However, as excited as I was when I learned Bosch would be brought to the small screen, I was also apprehensive. We’ve all seen more than one book or series get made into movies or TV shows with disastrous results. What would make this effort any different, especially since it is one of Amazon’s first attempt at an original production? So I was anxiously excited to see one of my favorite characters come to TV. I watched nervously. Twice. The pilot episode starts with Harry and his partner, Jerry Edgar, following a suspect. It ended badly, with Bosch killing him in a dark, rainy alley. 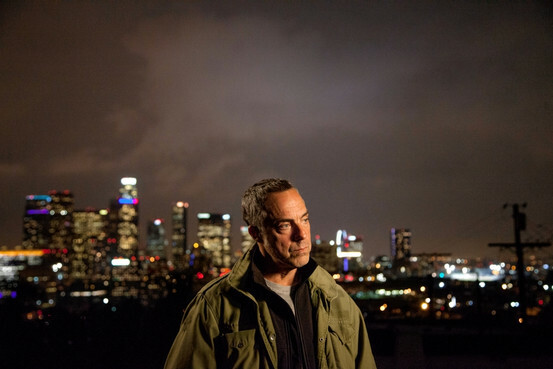 Bosch was cleared of the shooting, but that didn’t stop the family from filing a federal 1983 civilrights suit against him. Harry is caught up in the trial, bored, going stir crazy, needing a case to work on to ground him. Despite being told he was out of the rotation, he switched weekend call with his coworkers, giving them basketball tickets to make it more enticing, and caught a case that involved the bone of a child found in the woods. The episode ends with the trial and the case unresolved, enticing viewers to beg for more. And it worked. I want more Bosch. Amazon did a lot right in taking Bosch from Mr. Connelly’s books, and more importantly from my imagination, to the television…err… computer. The casting was excellent. Titus Welliver was a great choice; I can’t think of another mainstream actor that looks more like what I expected in Harry Bosch. The supporting cast was good, too. I particularly liked Amy Aquino’s role as the Lieutenant and thought she could be a great character as the show develops, even though that role is not part of the books. The show presented well, too. Since I don’t review TV or movies, it seems hard to explain, but the camera work seemed to present the show as a combination of professionally filmed with the just the right amount of reality TV to it. For example, the screen wasn’t jumping all over the place like in reality TV, but it wasn’t so smooth as to make it appear too controlled, either. I really liked how the show included Bosch’s love of jazz music. In reading the series that was always something I felt was neat, but nothing I could relate to. I never recognized the musicians that Mr. Connelly mentions, and despite my intentions to learn more about them while reading, that never happened. Hearing the music in the show, not overwhelming but there, with the character, in that setting, brings the jazz to life more than my listening at home could have. There were a few things that could have made the show better. First was Bosch himself. Mr. Welliver did a great job with the look and mannerisms of Harry Bosch: quiet, reserved, a black & white kind of guy about his job and frustrations with what he viewed as what was in the way of doing it. But I always thought of Harry Bosch as just a little more fidgety. The show did portray him as anxious, wanting a case, bored and frustrated with the lengthy court proceedings against him. But he was calmly so. I imagine a more frustrated Bosch, a little pacing, nervous movements, more obvious and recognizable impatience. Not a spazz, but more nervous energy. Another thing I thought would have been an easy fix to keep the show a little more real was the police station, Bosch’s office. In the books, Mr. Connelly repeatedly calls the work area of the detectives as “the table”, the homicide table, even going to the trouble of describing that desks are pushed together to create it. The TV show portrayed the office differently, and I think it would have been an easy and inexpensive way to show a little more of the reality of the working life of an LAPD Detective, of Harry Bosch, if it had been kept a “table” as Mr. Connelly had described in the past. One complaint many have when a book is made into a TV show or movie is what has to be left out. I understand that certain things have to be cut, either for time or because it’s doesn’t make the switch from the page to the screen very easily. In Bosch, there was a scene from a book that was included that I thought served no purpose: Harry was looking in the woods and fell, rolled down a hill, and collided with a tree. He broke or bruised some ribs on the way down. But the injury didn’t slow him down noticeably, and didn’t play a further role in the show. Without the aid of a photo or screen for readers to look at, an author can only do so much to describe things. Our imagination takes over. It fills in the blanks, sometimes even overrides one or two of the details offered by an author to better fit what matches what a reader creates in his or her mind. This is the beauty of reading. While we don’t control the story or its outcome, we can control how we envision it. It’s a wonderful thing. Unless you’re the one responsible for taking that book to television or the movies. Then it makes your job difficult, nearly impossible. The best producer, director, casting agent, and whoever else puts their talent and efforts in can’t replace the imagination of every person who picked up and fell in love with the books and characters that are the inspiration for their show. In the case of Bosch, Amazon Studios did a great job of bringing Harry Bosch to the small screen. The screenplay, story, casting, and acting all did justice to Michael Connelly’s Hieronymus Bosch. More than we can say for most efforts of televisionizing crime fiction! I hope other viewers agree, and the show is continued. This review was originally published on CrimespreeMag.com.